I have taken a guest blogging position on rGadget.com. My first post is Arrington’s CrunchPad in the Shops by November; Real Competition for Apple’s Unnamed iTablet and my author profile is here. It was once said that the computers on Apollo 11 had less computing power than a modern pocket calculator and now we can read to machine code and see! The code for the Apollo Guidance Computer, or AGC has been transcribed, by Google, from scanned images of printouts for both the Command Module (codenamed Comanche054), which reached moon orbit and was the return vehicle; and the Lunar Module (Luminary099), which took astronauts Neil Armstrong and Buzz Aldrin to the moon. Google also provide a virtual AGC which is an emulation of the on-board Apollo guidance computers, along with some ancillary items needed to make the emulation do something interesting. You can see the Google Blog entry about it all here. A couple from the United States got a shock when they learned their family photo was being used, unauthorised, on an advertising poster in Prague. Danielle and Jeff Smith used the photo as their Christmas card, and also posted it on an internet blog. A friend travelling in the Czech capital alerted them when he spotted the Smiths smiling at him, life-size, from a poster in a supermarket. Ubuntu is Now A Microsoft Product! Well at least according to Dell’s website. A 1.6GHz Atom CPU, 8GB of disk space armed with Microsoft’s latest masterpiece: Ubuntu! Thanks to Linuxologist for this. worshiped or preached, but only Christ and Him crucified. I don’t often “recommend” software but there are two critical bits of software that everyone needs a good anti virus and good backup. 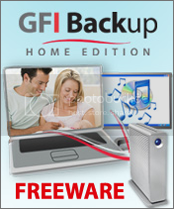 GFI Backup for Windows handles traditional folder and files backups, but it also has special options for backing up your registry, email, and program settings (including setting for programs like Skype, Putty, Photoshop, Dreamweaver, Winamp, Firefox, IE and Opera). Backups can be saved to CD/DVD, removable drives, LAN folders, or remote FTP. Scheduling, compression, and AES encryption are also supported. For those who use an external hard drive or a NAS, GFI can also handle synchronization tasks.